In the other article, you already know how to create Workbook and save them if you read those articles, you know that a single workbook contains different types of related sheets. Now to make it easy to identify every sheet, we will rename it to the name that best describe the content. 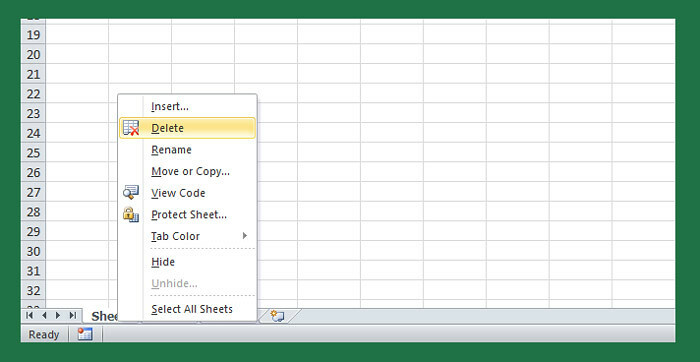 By default when you are using Excel 2007 and 2010, there are three blank worksheets namely Sheet1, Sheet2 and Sheet3 when you crate a Workbook. This is located on the bottom-left part of Excel interface when open, you can review our previous article basic parts of Excel. To rename the existing worksheet or the newly created, right click the sheet that you want to rename, then select rename on the menu that appear or the easy and simple way to rename is to double click the sheet and when highlighted, type your desired sheet name. If you don’t need the sheet, you can delete it, but make sure that you have a backup just in case you need in the future. If everything all set, right click the sheet that you want to delete, then select delete on the popup menu. When the confirmation window appears, click delete to confirm.